Ringtones say a lot about you, your style, and your attitude. And they can be a helpful aural cue to alert you to exactly who is calling. Yet, for some reason, the iPhone–the undisputed king of all smart phones–is limited in terms of ringtones. You can use either the small default selection that comes on the phone or purchase tracks from the iTunes store to convert for 99 cents each. If you’re looking for ringtone variety, that’s an awfully expensive way to go. There’s also a way to create customized ringtones using GarageBand ( ), but that’s a complex process that likely will not appeal to folks who don't otherwise use the program. Fortunately, there are alternatives in the form of standalone apps that let you create custom ringtones. I took a few of the available choices out there for a spin: PocketMac’s RingtoneStudio 2 for iPhone; Xilisoft’s iPhone Ringtone Maker for Mac 1.0; Pixel Research Labs' Ringer; and AMG’s Make Ringtones on your Mac. These apps are specifically designed to help you easily create a new set of ringtones that make your iPhone sing the tunes you want it to. PocketMac RingtoneStudio 2 for iPhone lets you create a new ringtone with a few clicks. Just drop a music file onto the interface (which looks like an iPhone), select the portion of the tune you want to use–up to 30 seconds, Apple says–and click Create. RingtoneStudio exports the new ringtone to iTunes automatically, ready for syncing. The current version of the product adds fade-in and fade-out options, volume boost, and a new waveform editor that looks similar to waveforms found in sound editing software. RingtoneStudio lets you zoom into a waveform up to 16x, and now features unlimited undos for volume adjustments. RingstoneStudio 2 shows you movie clips and lets you zoom in on audio. In my tests, the program worked quite well. I converted about 10 music tracks, including the song In Exile by Thrice (my current favorite), and RingtoneStudio turned the MP3 into a ringtone in seconds. The program supports the same formats as QuickTime, so that includes MP3, AAC, M4a and QuickTime movies–although you can’t convert MPEG-1 videos (because the audio and video are stored as one file). Unlike Xilisoft's iPhone Ringtone Maker 1.0 (which I'll get to shortly), RingtoneStudio 2 shows you a thumbnail preview of the video, not just the audio portion, so it’s possible to find that one jocular moment in Pink Panther 2 (and there is only one, by the way) and make it your ringtone. RingtoneStudio had trouble with a 2GB file (the movie Miracle at St. Anna, converted from DVD using HandBrake). Volume adjustments took over 15 minutes to apply, and the program became sluggish. PocketMac says the slowdown is a result of how RingtoneStudio analyzes the file and–for volume adjustment–changes the actual sound level, as opposed to just the QuickTime setting. PocketMac suggests using just a portion of the video to speed things up. RingtoneStudio 2 works well, but a few extra features like zoom and video preview do not justify the slightly higher price of $20 compared to $15 for Ringer and Ringtone Maker, especially since this app has a few bugs and supports fewer file formats than Ringtone Maker. Xilisoft iPhone Ringtone Maker 1.0 is compatible with a much wider variety of video and music formats than PocketMac's RingstoneStudio 2. In fact, Ringtone Maker supports just about every format I can think of: MP3, WAV, Windows Media, XviD (a popular BitTorrent file format), DivX, and more. 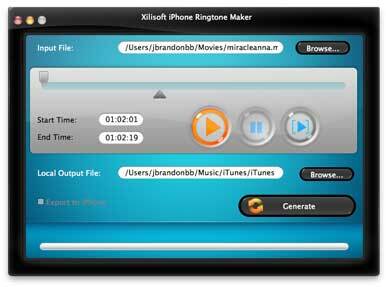 Xilisoft's Ringtone Maker works well and supports a large variety of file formats. Ringtone Maker gets the job done–but without any flare. The look and feel of the program reminds me of a Windows app circa 1999, with large bulbous buttons and goofy-looking shading. But no matter: in testing another 10 audio files, including the single by Echo & the Bunneymen called I Think I Need It Too (the smooth retro-synth song works well as a ringtone), Ringtone Maker rocked: it never introduced any audio glitches and worked extremely quickly. The app even handled a large 2GB movie file–the same Miracle at St. Anna feature film that RingtoneStudio choked on. One complaint: you can’t see video clips as you edit, although you can select a portion of the video using sliders and hear the sound from the video. Another oddity: I could select any segment of music or video no matter how long, although the iPhone itself only plays the ringtone for a set length–until you answer or the call goes to voicemail. I’d prefer a warning that says the clip is unnecessarily long. 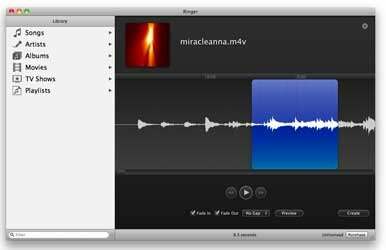 For the same price as Ringtone Maker ($15), Ringer actually has more in common with RingtoneStudio because it supports the same file formats as QuickTime (MP3, AAC, MOV, MP4, M4V) but no specialized formats, such as XviD or DivX. Yet, like Ringtone Maker, Ringer does not show you the video clip when you want to create a ringtone from your favorite Hollywood epic. One of its best and most unusual features: Ringer actually taps directly into your iTunes library. With other tools, you drop media onto the app and select the portion you want for a ringtone. You can use Ringer that way if you want, but it's easier and faster to just click an artist name or album and select a song. You can also choose songs from your playlist or click Movies to see any and all movies on your Mac, even video files you did not remember you had. Ringer took about three minutes to load the movie Miracle at St. Anna that caused problems for RingtoneStudio. Audio files loaded in seconds. Ringer does not show video clips, but it works reliably for a fair price. The interface for selecting a portion of a clip is easy to use–just drag the mouse to select the portion you want. Unlike Ringtone Maker, you can't select more than 40 seconds. The default view on Ringer shows a large window of the audio waveform–you can make the app larger on screen to see an even closer view. However, the zoom functions and fade in or out controls are more limited. For example, Zoom just maximizes the window without actually zooming. AMG (Advanced Media Group) Make Ringtones on Your Mac is essentially a collection of loops and GarageBand songs that you can use to create ringtones. As such, it’s a departure from the PocketMac and Xilisoft offerings, and is even different from how you'd normally create ringtones with purchased songs (by paying 99 cents and converting them). For the do-it-yourself approach, AMG has created a fun tool. The loops and samples from this collection are not recognizable songs. Instead, they are mostly techno/dance/trance loops that work well as ringtones. You can use a John Q ringtone for an easy-going vibe, or The Low End for an attention-grabbing chime. Make Ringtones on Your Mac also provides a tutorial on how to add ringtones to iTunes (just drag and drop), export them from GarageBand (most are already set to loop correctly and are about 30 seconds long), and set the current ringtone on your iPhone. I built several custom ringtones, and I like the loops–there’s lots of variety. You get a wide assortment of techno music to suit any mood, and I was impressed with the quality. There are about 300 ringtones and hundreds of loops and song clips to choose from. You can start with a basic GarageBand song and add your own loops, either from the included library or your own samples. However, AMG does not include any software, so you could just buy the loops you really like (even from AMG’s own Samples-now.com site) and follow the ringtone creation steps for GarageBand. You'd save plenty of cash that way. 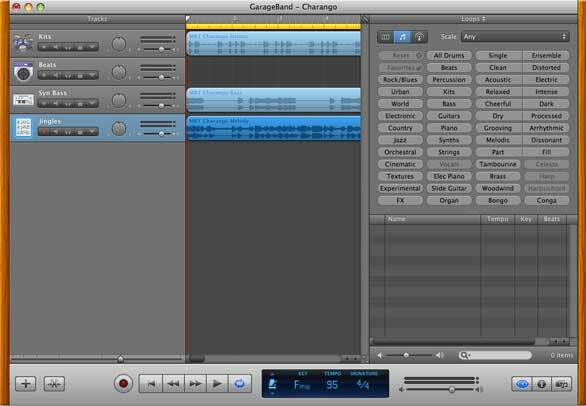 AMG's Make Ringtones on Your Mac is a collection of loops and GarageBand songs for creating ringtones. Choosing the best ringtone app was not easy–there is no single tool that outperformed all the others in the group I tested. However, my nod goes to Pixel Research Labs' Ringer because it works quickly, costs less than RingtoneStudio, and lets you select songs easily. I wish it showed video clips, and if you really need that feature, go with RingtoneStudio. Make Ringtones on Your Mac has a lot going for it as a ringtone maker, but it's not really a program, and is more than double the price of its competitors. For $40, if it included a simple song-to-ringtone converter, the package would make more sense. As it stands, you can buy just the loops you like online and go through the work of making ringtones in GarageBand for a lot less. (You can use its loops for other purposes, though–including creating an entire song.) For folks interested in the no-frills route to ringtones, I'd also suggest having a look at Audiko, a free, online utility that supports ringtone conversion from an audio file. It even supports fade-in and fade-out and creates iPhone-specific tones.